Jet fuel prices have had a critical influence on airline and route decisions. The rapid rise in prices during 2008 resulted in airlines retiring older less fuel efficient aircraft faster than originally planned. Combined with slower than anticipated deliveries of new aircraft, this slowed overall capacity growth and may have saved airlines from even larger economic problems during the Global Financial Crisis. Crude oil prices (Brent) reached a peak of almost USD133 a barrel in July 2008, before falling to a low of USD40 by the end of that year. During 2012-2014 oil prices levelled out but at historically high levels, and continued to impact on airline costs and profitability. Average monthly prices remained over USD100 through to late-2014 before falling to USD62 in December, the lowest monthly price seen since May 2009. 2015 saw further falls to result in an average annual price of USD52. The January 2016 price of USD31 per barrel was the lowest average monthly price since December 2003. Prices have since increased but to a level which is still half the average monthly price over the past five years (USD48 per barrel in June 2016 compared with the five-year monthly average of USD97). Source: US Energy Information Administration (EIA). 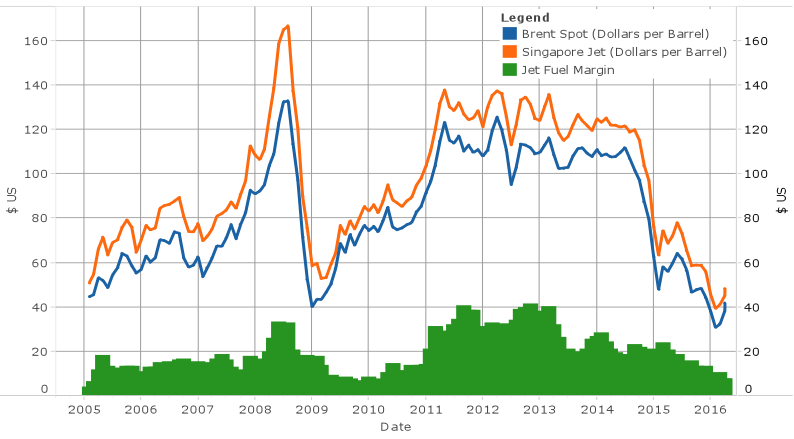 The following chart shows monthly movements in the average Brent oil price through to April 2016, along with jet fuel prices and the difference between the two – the jet fuel margin. Source: TFI based on U.S. Energy Information Administration. The US Energy Information Administration (EIA) expects global oil inventory builds to limit upward price pressures in the coming months and forecasts Brent prices to average US$42 per barrel over 2016. 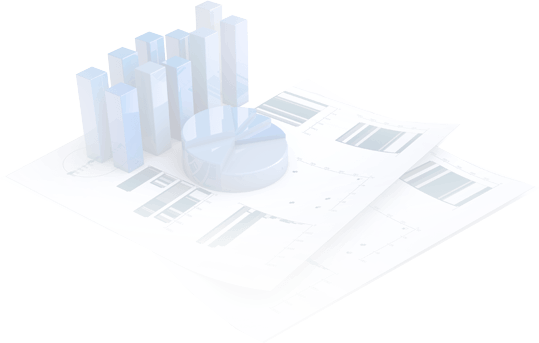 Expected inventory draws then contribute to an increase in the monthly average forecast price to US$52 per barrel for 2017. While noting that energy projections are subject to much uncertainty, the EIA’s May 2016 longer term projections (preliminary release) point to reference case oil prices lower than those in last year’s outlook, particularly in the near term. In the Reference case, the Brent crude oil price increases to US$77 per barrel in 2020 as demand and supply come into balance. After 2020, prices are expected to continue to rise, as growing demand results in the development of more costly resources. However movements in oil prices are highly uncertain and remain a significant risk factor in aviation planning.